I just got the cover for MR. MONK GOES TO GERMANY… two days after I turned in the manuscript. Who says publishing doesn’t move fast? (Click on the image for a larger view). I am heading to Munich this afternoon for ten days to do some consulting for one of the German TV networks, so I may not be posting very often until I return. I’ve just figured out how to update my blog using my Crackberry, so you may be seeing some posts with a Blackberry tag on them. Forgive me if they are awkwardly formatted or typo-ridden. Genevieve Bujold was supposed to be the star of STAR TREK VOYAGER, but a week into shooting, she was fired…or she quit… and was replaced with Kate Mulgrew. I’ve always wondered why. Thanks to the miracle of YouTube, the mystery is solved. You can see how uncomfortable she was in the role. Here is a scene with Bujold and then the same scene re-shot with Mulgrew (catch it now before it’s inevitably yanked). Here is another scene with Bujold. From Mrs Aluwa Cabenca Williams & Son Benjamin. My Name is MRS. ALUWA CABENCA WILLIAMS a citizen of Sierra-Leone. A widow being that I lost my late husband couple of months ago. When my late husband was alive he was dealing with international REAL ESTATE agency until his death. My late husband CHIEF CABENCA B. WILLIAMS left behind a total sum of (US$ 18.500.000 EIGHTEEN MILLION FIVE HOUNDRED THOUSAND U.S DOLLARS) My late husband package this money in one trunk box and deposited it in the Security Company here in Abidjan Cote D’Ivoire, and the Content was mentioned as a family valuable. He told me to look for a good foreign partnership and ship the trunk box for foreign investment. He advice me to invest this money on real estate or transport industry business. Through I have not met with you before but I believe, one has to risk confiding in someone to succeed sometimes in life. Me and my only Son Benjamin have visited the Security Company and approached to to the director and presented to him the entire document my late husband left to us, bears with the name of my son Benjamin as the next of kin and including his death certificate. I want to follow the instruction of my late husband to invest the money with my only son in your country, I will like to invest part of the money into any of these three investments plan in your Country as bellow. But if there is any other business with good profit, that is better than what I am suggesting, we will be very glad to follow your advice. Please come up with your idea. I humbly request you to participate in this transaction and also give me professional directives If you are in interested and willing to assistance us. We will be pleased to offer you 25% of the total sum as compensation for your effort /input for the successful shipment of this Trunk box to your destinations address for the Investment Project. Mrs Aluwa Cabenca Williams & Son Benjamin. You would have to be born with only a brain stem to fall for a scam like this. I have no sympathy for anyone that stupid. Today is the official publication date for MR. MONK IN OUTER SPACE, my fifth MONK novel. You should be able to find it at bookstores nationwide and, of course, at your favorite internet retailer. The book was more than a little inspired by my own experiences as a writer for Starlog magazine, a supervising producer on SEAQUEST and my, um, "debates" with fanficcers here (you might also notice a nod to my comic novel BEYOND THE BEYOND). I hope you enjoy it! I’ve been so busy over the last few months that I’ve missed a lot of TV crime shows. Today I indulged myself and caught up on the first four episodes of DEXTER. Wow. What a great series. It’s wonderfully directed, well-written, and pitch-perfect in tone. That’s not to say there aren’t problems (the mean, overly political lieutenant, the angry black cop, and the Asian lab guy are drawn way too broadly, past cliche and into caricature), but the pluses far outweigh the minuses. Michael Hall is amazing in the role, walking a very delicate balance and pulling it off every time. I’ve read DARKLY DREAMING DEXTER, the book that inspired the series, and I admire showrunner Clyde Phillips’ shrewd decision to stretch the novel’s central plot over the entire first season while still doing nearly standalone episodes. You’ll notice I said nearly. Although there’s a strong, narrative arc, the individual episodes are still satisfying on their own, while still largely open-ended story-wise. (The series is very loyal to the book and yet its one of the rare cases in which the TV series is far better than the original work that inspired it). 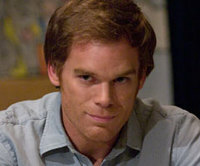 Although DEXTER is on Showtime, it could easily be mistaken for a USA Network series..if it wasn’t so bloody and dark. It’s got the quirky, socially-awkward, single-lead detective with psychological problems and a keen eye for detail (MONK, PSYCH) who had a strange childhood (MONK, PSYCH) that strongly shaped who he is…memories of which are revealed in flashbacks with his father (PSYCH). It’s also got a sunny, beachy locale (MONK, PSYCH, BURN NOTICE). I hope the rest of the episodes are as great as the first four. If the first season ends the way the book did, I’ll be curious to see if they can find their creative footing again in the second season. It’s 10:07 pm here in Los Angeles and I just finished writing my sixth MONK novel, MR. MONK GOES TO GERMANY. This means I will be delivering my book to my publisher two weeks early, which will buy me a little time to relax before plunging into the outline for my seventh MONK novel. 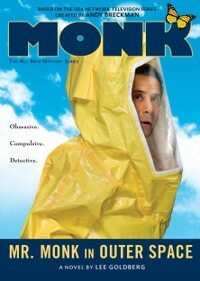 MR. MONK GOES TO GERMANY will be out in hardcover in June to coincide with the summer season premiere of the TV series. My fifth MONK novel, MR. MONK IN OUTER SPACE, comes out in hardcover later this week…which is a bit of an experiment, since this will be the first MONK book release that doesn’t coincide with a MONK season premiere. It will be interesting to see how the book fares without the benefit of the promotion that accompanies the TV show (but my fourth MONK novel, MR. MONK AND THE TWO ASSISTANTS, comes out in paperback in January, when the new episodes of MONK return). Not only have I won a BMW and over $2 million this week, now I can have a share of a $19 million fortune just because my last name is Goldberg! I know this is a genuine offer because the situation described in the email sounds completely reasonable, legal, and logical and it came from a lawyer. It feels so good to be rich. I have contacted you to assist in distributing the money left behind by my client before it is confiscated or declared unserviceable by the bank where this deposit valued at Nineteen million dollars (US$19 million dollars) is lodged. This bank has issued me a notice to contact the next of kin, or the account will be confiscated. My proposition to you is to seek your consent to present you as the next-of-kin and beneficiary of my named client, since you have the same last name, so that the proceeds of this account can be paid to you. Then we can share the amount on a mutually agreed-upon percentage. All legal documents to back up your claim as my client’s next-of-kin will be provided. All I require is your honest cooperation to enable us see this transaction through. This will be executed under a legitimate arrangement that will protect you from many breach of the law. If this business proposition offends your moral values, do accept my apology. I must use this opportunity to implore you to exercise the utmost indulgence to keep this matter extraordinary confidential, whatever your decision, while I await your prompt response. Please contact me at once to indicate your interest. I will like you to acknowledge the receipt of this e-mail as soon as possible and treat with absolute confidentiality and sincerity. I look forward to your quick reply. I am on a big winning streak. A few days ago I won a BMW and $850,000. Now I’ve won €750,000. I can’t believe my luck. I am tempted to head straight to Las Vegas! sponsored by the SWISS-LOTTO organization. a lump sum pay out of ? 750,000 Euros. your winning funds as soon as you contact them. companies and individual email addresses. and thank you for being part of our promotional lotto program.